Figure 7. Main phases of the movement made by the Riomartino trackmaker. (a) Resting phase in ‘crouched’ position; (b) the trackmaker walks in a ‘crouched position’, while the right footprint is being definitively impressed; (c) initial rising up and defin-itive impression of the second left footprint; (d) final kick-off. We compare theropod footprints with elongate metatarsal prints from central Italy with known autopod structures in major theropod groups, in order to more accurately define the trackmaker attribution. Our work, using morphometric analysis, shows the considerable potential of explorative methods such as PCA (principal component analysis) and cluster analysis when describing important characters for a given taxonomic group (body and ichnofossils) and identifying important anatomical regions. 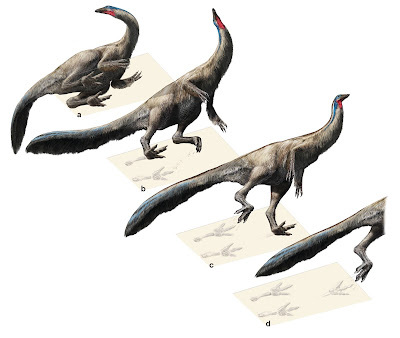 Moreover, the results of the analysis suggest that the putative trackmaker is likely a member of Ornithomimosauria, with significant affinities in the posterior autopod structure with the genus Struthiomimus. The fundamental importance of integrating both osteological and ichnological data, when investigating locomotor and behavioural hypotheses, is highlighted. This approach could also contribute positively to the complex cognitive process of trackmaker identification and be favourable for the attainment of a more natural definition of ichnotaxa. Our work highlights the great potential of morphometric methods to describe specific characters of a given taxonomic group (both in body fossils and in footprints) more objectively, as already convincingly pointed out recently in the literature (Castanera et al. 2015).These approaches integrate morphometric analysis with footprint morphology and differential impression depth (‘footprint holomorphy’ sensu Romano, Citton & Nicosia,2016), and may shed light on taxonomically relevant characters but also on the biomechanical properties and importance of selected anatomical regions.The latter, cross-checked and plotted on a phylogenetic analysis, can be pivotal for understanding in which particular node and branch a specific morphology, or even a particular behavioural trait, has been acquired.Such integrative approaches also shed light on the dispersal of different clades and different palaeobiogeographical models. In this study, we consider it likely that dinosaurs could reach the Apenninic Carbonate Platform only through migration routes from Gond-wana through the Adria region. The identification of a struthiomimid-like theropod as the putative trackmaker of the new Italian material further supports that putative Ornithomimosauria were present in Gondwana, as pre-viously suggested by other Italian tracks and skeletal material from South Africa. Ichnological data proved to be once again a crucial source of evidence, especially in cases where the body-fossil record results are virtually absent. As we have experienced in recentyears, ichnology has passed, in all respects, from a mere curiosity or corollary of vertebrate palaeontology, to acritical mass of ‘pawing’ often unique evidences and inferences.